The EURUSD has seen the price move up and down in trading today as the market non-trends. Frustrating traders looking for directional moves is the pair did fail on a break of support in the London morning session. That break say the pair's price move below it's 100 hour MA, trend line and swing area (see yellow area). That move should have solicited more selling. FAILURE. The pair is moving back into negative territory over the last few minutes of trading after the move higher stalled ahead of the 50% midpoint of the move down from the March 20 high (to April 2 low) at 1.13154. The price is back below the 1.1300 level as well now. 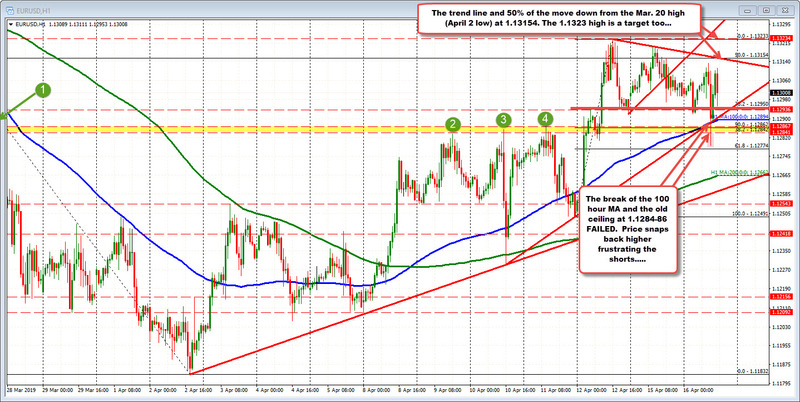 THe 100 hour MA and trend line remains a key target below at 1.12894 area. After that the 1.1284-86 area will be eyed. The ups and downs can beget more ups and downs. With a fail below the 100 hour MA, et. al. that area may/should find support buyers but expect stops on a break (and 2nd chance sellers on the break). On the topside, eye the 1.13154. PS Golds decline is helping USD bulllish sentiment.